Exposed portion of Bryn Athyn Cathedral's cornerstone with the Hebrew words lerosh pinnah (the head of the corner) from Psalm 118:22. On June 19, 1914, members of the Bryn Athyn New Church congregation participated in a cornerstone laying ceremony for Bryn Athyn Cathedral. Ground had been broken in the fall of 1913, and by the next summer construction was underway on the basement foundations. The date of June 19 was chosen because it coincided with an annual church celebration known as “New Church Day.” Clouds and rain earlier in the day had threatened to postpone the ceremony, but the sun managed to break through the clouds at the very moment that the stone was dedicated by Bishop William F. Pendleton. History provides us with many examples of cornerstone laying ceremonies for both civic and religious structures. President George Washington presided over the laying of the cornerstone for the Capitol building on September 18, 1793. A cornerstone laying ceremony is a symbolic act, and for Christian churches quotations from both the Old Testament and New Testament are often cited. The most important biblical quotation used during the cornerstone ceremony for Bryn Athyn Cathedral was Psalm 118:19-24. Bishop William F. Pendleton explained the symbolic meaning of the Cathedral’s stone during his dedication remarks: “This corner stone is laid in its place, as the foundation stone of a building . . . to be devoted to the worship of the Lord Jesus Christ; and it will henceforth rest in its place as a representative of the Lord, and of faith in Him, as our God and Savior, the Shepherd and Stone of Israel” (Raymond Pitcairn. Letter to John Pitcairn. 23 June 1914. Glencairn Museum Archives). Figure 1: From left to right, Raymond Pitcairn, Edward Kessel, and Pringle Borthwick measure the cornerstone before it is split from the larger boulder. Figure 2: Raymond and Mildred Pitcairn pose on the cornerstone in the woods with their son Nathan. Pringle Borthwick, the masonry contractor for the Cathedral project, was the one responsible for locating a stone. He “scoured through the woods for a suitable stone and discovered the one” that was eventually used (Bryn Athyn Church: The Manner of the Building and a Defence Thereof. Book draft two, p. 34, Glencairn Museum Archives). Raymond Pitcairn documented the stone in a series of photographs on glass negatives, now in the Glencairn Museum Archives. A number of the photos show what was to become the cornerstone while it was still in the woods, before it was cut from the larger boulder. Figure 3: A large stationary frame was constructed with a block and tackle to lower the seven-ton cornerstone during the ceremony. Pictured from left to right are (first row) Raymond Pitcairn; (second row) Edwin T. Asplundh, Robert Tappan, Albert C. Perry, and Pringle Borthwick. “It had rained and was cloudy all the forenoon, and looked as though the ceremony might have to be postponed from Friday until Sunday. In the afternoon came a clearing shower, but by five o’clock, the rain again threatened ominously. At half past five we had all gathered in the chapel which was full to overflowing, and the services opened . . . The Bishop, carrying the Word in his hands, followed by the choir and by all the congregation, commencing with those nearest front until all had passed out, marched out. I met the Bishop at the foot of the stairs to act as guide, and several young men ran in advance to guard the turnpike [Second Street Pike] to prevent vehicles from breaking the procession, which followed slowly and silently down the avenue . . . and wound on up the hill to where the corner stone hung in a great frame . . . The mortar was spread under the stone while the procession was on its way. Boards had been placed over the foundations of the sanctuary, and as the congregation approached, a rope was held by several young men until a circle had been formed by the people gathered all around the huge rock” (Raymond Pitcairn. Letter to John Pitcairn. 23 June 1914. Glencairn Museum Archives). Figure 4: From left to right, Edward Kessel, Pringle Borthwick, and Raymond Pitcairn strike a pose with hammers and wedges in preparation for splitting the cornerstone from the boulder. The Bishop then read a series of biblical passages with reference to foundations and stones: Psalm 118: 19-24; Isaiah 28:16; Isaiah 44:28; Daniel 2:35; Psalm 18:31; Psalm 89:26; Matthew 21:42; and Matthew 16: 15-18. Figure 5: Mildred and Raymond Pitcairn visit the cornerstone with their son Nathan during the summer of 1914. The curved wooden structure in the photograph was a temporary frame used in the construction of an arched stone ceiling under the Cathedral's sanctuary. Pitcairn’s letter continues: “The congregation then sang ‘Jerusalem the Golden,’ during which the great stone was lowered by Edwin [T. Asplundh]. I held the southeast corner and Mr. [Pringle] Borthwick, the northeast corner. Mr. [Robert] Tappan was at the northwest corner and Mr. Borthwick’s head mason at the [southwest?] corner, while Mr. [Albert C.] Perry watched a guiding mark in the stone. By the close of the hymn, the stone was in place, and we all drew back into the circle where I stood beside Mildred, who was waiting for me” (Ibid.). Bishop Pendleton then formally dedicated the cornerstone (see quotation in the first paragraph, which is a portion of his remarks). At the close of the ceremony the congregation proceeded back across Second Street Pike, and ended the evening with a banquet. Figure 6: The cornerstone in place as construction proceeds during the summer of 1914. Ralph Adams Cram, the head architect at the time, was invited to attend the ceremony, but was unable to come due to another engagement. Two of his architects, Robert Tappan and Albert C. Perry, acted as representatives of the firm and were given a special role in the event (as described above). Pitcairn sent Cram a copy of the letter he wrote to his father so that he would have a full record of the day. At some point the Hebrew words lerosh pinnah, “the head of the corner,” were carved into the stone. E. Bruce Glenn, the author of Bryn Athyn Cathedral: The Building of a Church (1971), identified the carver as Edward Kessel. 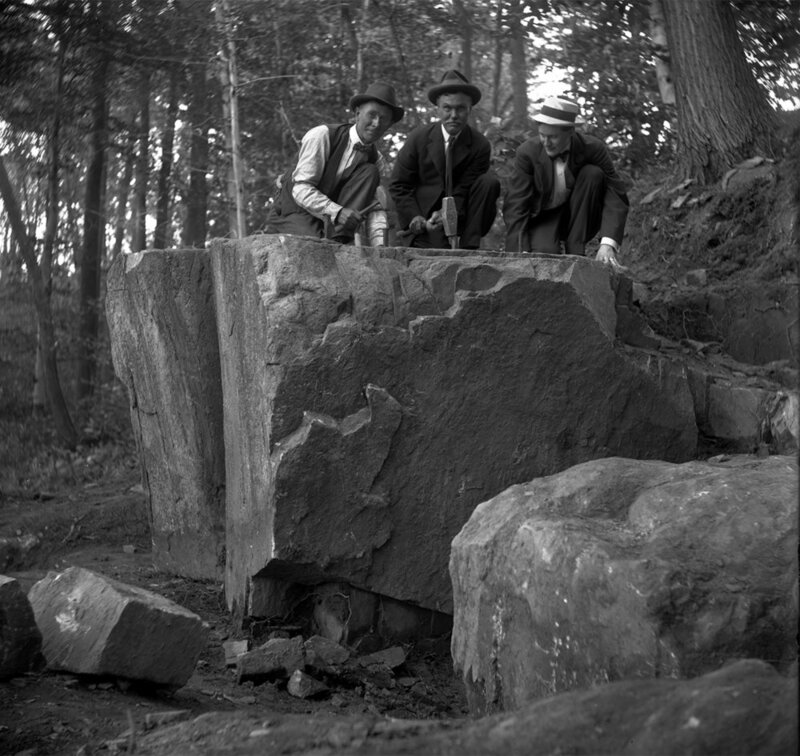 Kessel was the quarry superintendent, and can be seen in a number of archival photographs measuring the stone in the woods (Figures 1 and 4). Glencairn Museum News has been unable to locate a photograph of the ceremony itself or those in attendance. The editor would be very grateful to receive such a photograph.